Once a local business has accomplished setting up their basic foundation for local search optimization, they sometimes dither around wondering what tweaks they can do next to help themselves rank better for local search queries and in map searches. One major area of optimization that many businesses ignore is in optimizing their images. While you may not care about whether your site ranks well under image search, the advent of Blended Search (which Google calls “Universal Search”) has meant that pictures often have the chance to rank on the main search results page. Even before Google, Bing, and Yahoo! had really pushed Blended Search results, well-optimized images were already a major component for helping webpages to rank well in keyword search results. Since this can help in the same way with more specialized local search results, here are a handful of optimization tips to help you get as much advantage as possible from images. Once the basics are done you may now try out these various image optimizations. Use an Exemplar Photo to represent your business! On your website, it’s ideal to use a picture to really exemplify your business — I call this an “Exemplar Photo”. This can be put on your home page, or on the About Us or Contact page, and it should be a photo of the storefront, or the main product you offer, or the proprietors. While you could use the company logo for this purpose, it’s better to use an actual photograph. The photo you choose for this ought to be able to convey its image contents when shown at both large and small thumbnail sizes due to how it might be treated by various other internet services we help it engage with. It will work best if it is fairly high-contrast as opposed to containing elements that all have similar tonal values. So, this means it should have some lighter elements and darker elements in it, since this will help it communicate well even when reduced down. In this way, the filename will match more closely with keyword phrases that users are submitting to the search engines in order to find your type of company. Notice that I’ve separated the words with dashes — it’s best to do this to help search engines match for multi-word keyword phrases. Don’t leave spaces in filenames because those often need to be filled-in by some characters to work properly with some types of file servers and systems. Using actual words in the filename also makes the image names appear more user-friendly in Google Image Search, since they updated their interface to display the filenames more overtly. In most cases, a local business’s main keyword phrase should describe the type of the business and the city or locality name. 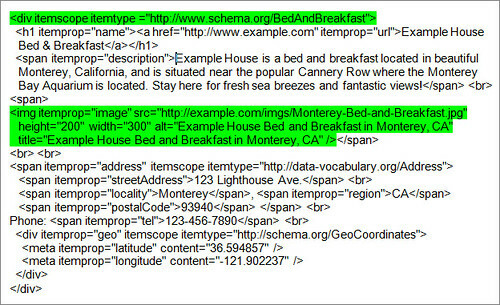 In this example it is “Monterey Bed and Breakfast”. Avoid adding non-letter symbols like apostrophes, asterisks, etc to filenames (dashes are okay). Add good ALT text and Title parameters to your image. 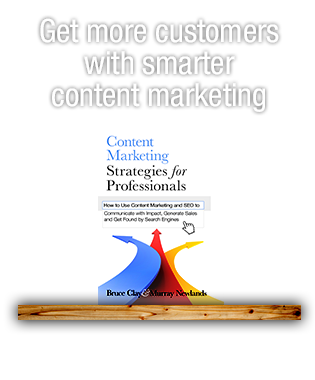 These should also reflect the image’s content and should reinforce your local keyword phrases. ALT text is one of the classic old SEO signals and is still highly effective. ALT and Title parameters for images help search engines understand what the image content is about, and can be helpful for audio browsers used by those with visual disabilities. Add the image into Flickr, and link back to your website from it. I’ve touted Flickr many times over the years because it’s one of the best search-optimized photo sharing sites around. Since it’s set up optimally, it doesn’t require users to do a whole lot in order to make a photo’s page work well for SEO purposes. You’ll need an account there (if only doing a few images it can be a free level account), and you’ll upload your photo into it. Once uploaded, customize the photo’s title with your business’s name, type and location, then write a well-crafted description with plenty of facts about your business below it. In the description, you can include hyperlink code to link back to your website URL — do so, and use keyword-rich text for the link label. Also add in keyword tags for the photo, and join some groups to add the photo to as well (only groups appropriate for the photo, such as one devoted to your city, and follow the group’s rules about additions). While Flickr automatically nofollows links, Google reserves the right to choose if/when they’ll still count a link’s value, and the keywords used in the link text may still get associated with your site. There are other photo sharing sites out there which are also worthwhile for helping you build links and signal about your company site, but start with Flickr first. Upload the image to your Google Place page for the business. As part of your overall business profile optimization in all major directories, it’s a good idea to include an exemplar image to represent you, since this helps attract consumers’ eyes, compared with text-only information pages and listings. However, in Google, this might help even more since Google believes images make for a better user-experience for searchers, and Google has a tendency to weight experience-enhancing business listings for better ranking. 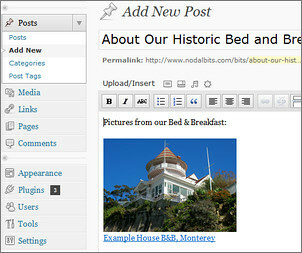 Add an image about your business to your blog! If you have a blog (and you really ought to consider having one if you do not), then add an image about your business there with a link in the caption area below the image back to your main homepage. This could be done on the “About Us” page of your blog, or it may be even better if it’s done as just a simple blog post which features your business. Naturally, make the page talk about your business, it’s location and what it offers, and use good ALT text with the image just as we earlier outlined. Using a caption with a brief description of the name, business category, and locality for your company, with the company name linked back to your site, is pretty effective for associating an image with your business name and reinforcing what kind of business your company is. These sorts of signals can help you in local rankings. 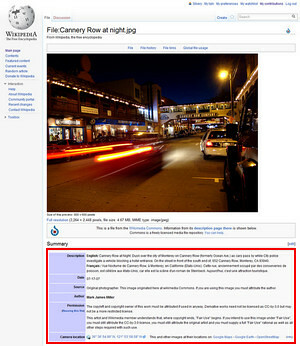 Donate an image to Wikipedia! Wikipedia is very conservative about people adding too many commercialized links into the online encyclopedia, but one area where they’ve allowed it has been in cases where people have donated images for public use. If your local town, county, or neighborhood page on Wikipedia is in need of an image to help represent it, as a person who is located in that area you have an advantage — you can take a good, representative picture to donate for the page. When uploading the image you should specify one of the Creative Commons licenses, particularly one requiring attribution. When adding in your description into the Summary (outlined in red in the example picture), you can state that the image was provided by your business name, and link back to your site. Just as with Flickr, Wikipedia nofollows links, but there’s been some debate as to whether Google still counts PageRank for Wikipedia links, and there are indications that links from Wikipedia pages are still helpful in ranking determinations. So, obtaining a link from a photo page associated with your locality may help you get a type of link that’s contextually relevant. If you do want to donate an image to Wikipedia in return for a link, proceed very carefully and consider asking a more experienced Wikipedian to do it for you. The rules for editing and adding content can be arcane to a newbie, and if you’re not familiar you can run aground and get your content deleted. So, there are a few image optimizations which can be beneficial for your local business website! You don’t have to limit yourself with just these, however, since on-page image optimization really ought to be done for all images on your site. Start with the most important images and go from there. Also, continue to add in images over time — on your blog, on your website, on Flickr (linked back to your site) and elsewhere, and optimize them as well. All of these extra signals can accumulate over time and will help you achieve rankings in Google Place Search, Google Maps, and your images may rank as well under Universal Search, Image Search, etc. 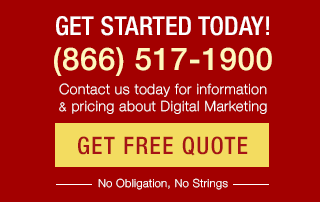 Chris Silver Smith is president of Argent Media, a search engine marketing agency in Dallas. Prior to Argent Media, Chris was with KeyRelevance, Netconcepts (since acquired by Covario), and Verizon's Superpages.com. 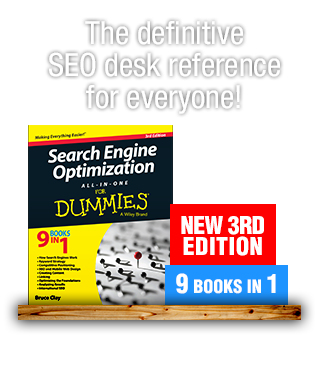 Chris has done research on SEO since 1997 and is a frequent Locals Only columnist at Search Engine Land. Chris speaks at various industry conferences and also blogs regularly at Nodal Bits and SEM Clubhouse. Kevin, I think that it’s high time that Google standardized some of their image services — I think they ought to merge Picasa and Panoramio, for instance. Both of those services can be useful for Local Image Optimization, since they allow for geotagged images, and they feed into Google Maps, if you allow that in image permissions. So, using Picasa/Google Images and/or Panoramio as well as Flickr can be worthwhile for promotion. However, the way things currently stand, Flickr beats those services hands-down in terms of SEO value. 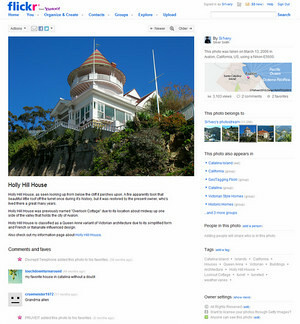 Flickr has a larger number of users (audience share), and more SEO-friendly features. So, if you have limited time, you’ll be better off using Flickr for now. There are even quite a few Googlers who use Flickr, because it’s better than their own in-house services. Depending on how Google integrates images with Google Plus, it could become more valuable, particularly if Google uses social media signals from Google Plus image postings to combine in their ranking sauce. However, this is still in flux, and it’s not yet certain whether it will have more value above the well-established advantages of using Flickr. I suspect that Flickr will continue to have significant value into the future, too — consider that if Google wanted to make it an either-or proposition, they surely would not have integrated Flickr feeds into Google Maps. So, for now I advise sticking with Flickr, but stay tuned to this channel, since I reserve the right to reverse myself as conditions change in the future. What do you think about Picasa becoming Google Images? With the launch of Google+, do you think its a good idea to start using “Google Images” also OR in place of Flickr? Just seeing how those images will be synced up with G+ which I think would be awesome for us going forward. I think I know what you’ll say which is stick with Flickr… BUT knowing the best strategy, right now, as Im launching a whole new website/brand would be awesome. A lot of people overlook Flickr because they think it’s dying out; however, I am always browsing flickr so uploading your photo and linking it to your site will drive traffic to your website. I am starting to publish more articles and pictures on our company’s blog and this article will be of great help! Google is now controlling the first conversion of our site, the conversion from searcher to visitor. These are very helpful tips for managing the part of our Web site that lives on Google’s servers. good job, thx for these tipps. but in the long term you’re one step before your competitors! Birger, I doubt EXIF data has a direct effect on rankings. 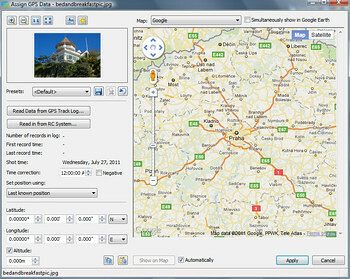 However, the point is to add geocodes to the EXIF to help increase the local signal about your business. The collection of signals that reinforce the location profile help in combination to verify it for local search. 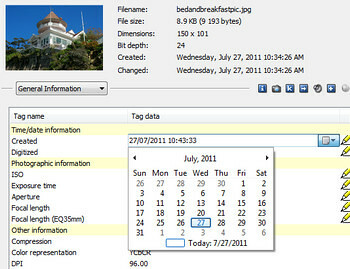 On Flickr and some other sites, this EXIF data helps insure the photo gets mapped to its location automatically and results in a separate information page about the photo — which will include the longitude and latitude values in text on the page where search engines can crawl it. This article was being discussed over at Cre8asite forums and I’m so glad I came here to read it. Wonderful suggestions and some neat ideas I had not thought of before. Should give business owners and Local SEOs a great little to-do list! Hi Chris, thank you for this great list! Do you really think that the EXIF data has some remarkable (or measurable) impact on a pages position? Hi, Kent – there are a few ways to use the EXIF data for images. One way is to take photos with a GPS-enabled camera, which will stamp the geolocation coordinates into the image EXIF fields automatically for you. The method I showed above was using some free EXIF editing software I found on the internet — there are a few different software applications which do this, and I’ve used a couple of them. It’s been one or two versions ago that I last used Photoshop, so I can’t tell you if it provides the ability to really edit EXIF fields — the last version of it that I used did not allow one to edit EXIF data. Hi Chris, we can’t export image’s EXIF data by using photoshop? Only camera can do it?